Nick Gengozian is a top-notch craftsman. His flooring and stairs are beautiful works of art. He worked with his father for years and now has started his own venture, Signature Edition. It was really fun doing a more masculine brand. The look is timeless, much like all of the work that Nick does. SO SO SO fun rebranding The Paper Lady. The store is a long-time staple to the Denver Wash Park area, occupying a prime spot on South Gaylord. The proprietor, Rosie, is incredibly talented and detailed oriented. I got to play the student with all of her font knowledge! I am excited to see how the new branding will play into signage and advertising! This was a back door job. Blue Family really really needed a new website. But once we started talking they decided that they needed new branding even more! This is a small group (all related ... go figure!) and they are so fabulous at direction and making decisions. It was truly a pleasure working with them. My favorite comment while asking about their prior logo was "we don't even own or manage any tall buildings!" Being a family affair, I thought it only proper to give them their own monogram. They do so much within their small shop and the logo and it's alternate marks needed to convey their specialties. I think it is a huge improvement! The press around Whitney Plantation has been tremendous. We just placed ALL of these logos in their tourist brochure. Having just read Between the World and Me (whew .. what a read!) I am so impressed with the conviction to document this part of our history that has so long been ignored. The above video about Whitney in The New Yorker is just beautiful. Starting to ramp up for this year's auction. I am so excited to design new patterns for this preppy affair. I have loved working with these South African expats! They are taking the States by storm and opening a fitness studio in Boulder (what better place to mix technology with working out?!?). Their homemade logo needed a refresh. See all of their brand boards below. The name changed as we were in the process of branding. Testament to never be too in love with one design! Busy busy year. I have barely been able to check email, much less update a blog. But it has meant that I have a nice 2015 portfolio! Back in August I had the honor of winning the SAFE account. 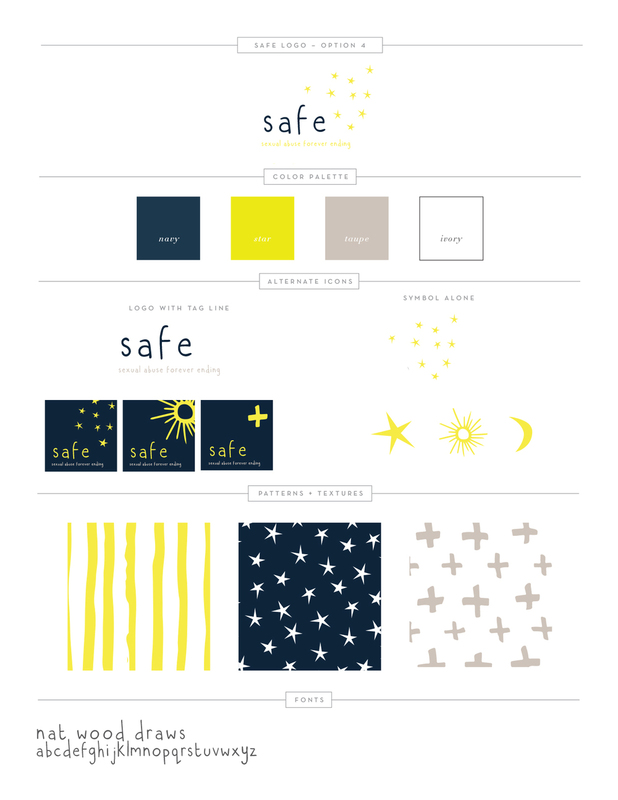 SAFE stands for "sexual abuse forever ending". Working with non-profits in general is humbling. Working with the two founders of this beautiful endeavor has been awe-inspiring. There is so much good happening in this world. I wish that it would overshadow the bad that fills our radios, TVs and news feeds. Below are favorite ideas presented to SAFE. The themes that I was using: safety (shield), comfort (nature), from dark to light and putting pieces back together. 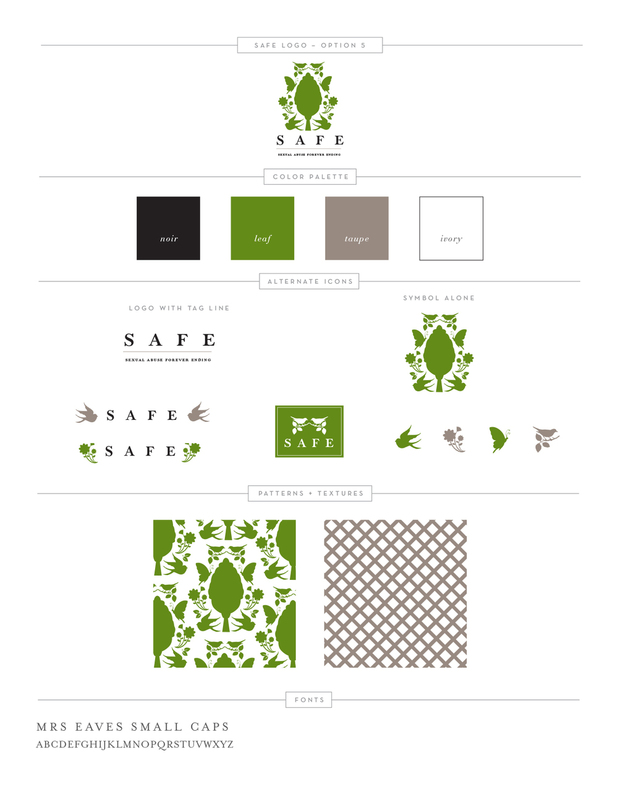 To find out more about SAFE, visit their website (still under construction). Our son Davis is featured in Proximity Magazine. Check out his amazing talent in this photo essay. Thank you Aunt Towles for all of your encouragement and love! Every Christmas I get the crafting bug. And if you read the "about" page you know that I am a very reluctant crafter. I like fast crafts that look like they took a long time. I am all about eye-balling. So this year, I combined this pin and this pin to come up with the rustic-lux dotted ring dish. S T E P 1: Using a tennis ball size hunk, roll out your clay until it is an even, 1/4 inch thick. S T E P 2: invert your bowl and twist a few times into the clay until you are all the way through. Lift bowl away. S T E P 3: Peel away excess clay and set aside for your next bowl. S T E P 4: Press the disk of clay down into your bowl. Do not push it in the center too hard. It does not need to touch the bottom. At this point you can smooth the edges with your finger. S T E P 5: Let dry for 24 hours. Do not try and take the clay out of the bowl until at least 12 hours later. You may need more drying time for the unexposed edges. S T E P 6: Paint the bottom. Let dry. S T E P 7: Paint the inside and top edges. Let dry. S T E P 8: Paint your dots. Less is more here. people! S T E P 9: Paint a clear gloss coat. Let dry. Besides waiting on the clay to dry, this is a FAST, fun craft. I made many bowls all at once and then painted them the next day. We gave them as teachers gifts, with a quote saying "this gift is to hold your precious things since you hold our's all day long". I am floored at how often I get to work on projects in which I believe wholeheartedly. 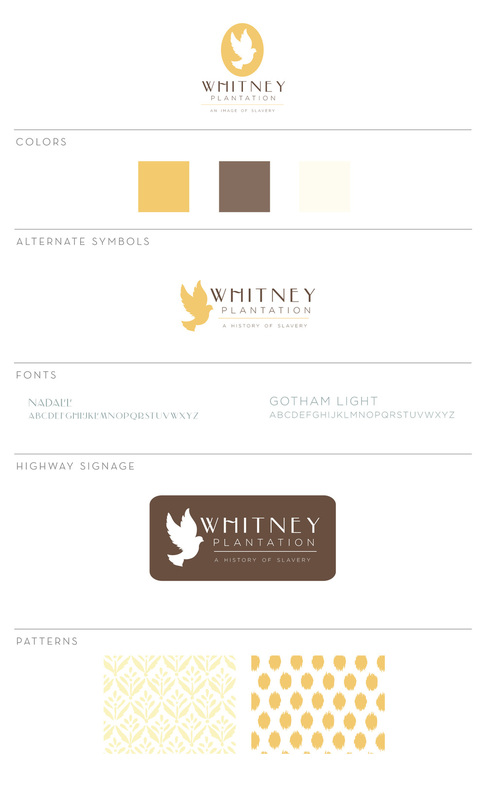 The Whitney Plantation project came from a local Denver woman who saw some of my Vela designs. She is from Louisiana. Her father bought the plantation years ago with the dream of making it an homage to slave children. The site has commissioned, life-size bronze statues standing hauntingly across the grounds. The Field of Angels lists the names of all known children who died, frequently using only first name. My client sent me pictures for inspiration and I had chills as I looked through them. I love that I can be a part of such an important place. The last design is what they liked best. I am finishing up my branding for Modlux Denver. Have you ever met with a client that already had all of her colors picked out? Or three main words to describe her the look that she wanted? It is a dream! Elysia and her husband are a team. They create, revamp and sell the loveliest homes all over Denver. Elysia chose the above design. Below are the extra designs. I am working on the website now ... link coming soon. I just entered five new holiday card designs on Minted! Voting starts later this week. Please vote if you have a chance! And yes ... I did enter a card with the words "nut balls". Thanks TCG. I recently had the opportunity to work with some fantastic people in Chicago on ads for prenatal vitamins. In the first briefing, I told them that the job was custom fit for me. They wanted to see vintage, modern and storybook style layouts. The art director was so organized, with mood boards and color choices. It was so much fun! Above is the final ad that the client chose. You can see the other vintage and modern layouts below. I just came across these logos for a potential client who never became an actual client. They were to go on foods containing Maya Nuts, an relatively undiscovered super food. I think the logos are fine. But what I had forgotten were T's tag lines. SO funny. My favorite is "Maya What??? Maya Nut!!!" I just finished up two jobs for parties on the East Coast. I am always so behind when planning my own children's birthdays, it was fun to see what could be done if there is organization involved. One birthday has a Frozen theme and the other a Science theme. Without a doubt, both parties will be replicated in this house! All printables are for sale on my Etsy site. I also am available for more custom projects! While in Chicago, T and I worked with Rick. Within the first few weeks of our job, he announced that I needed to be friends with his wife. And he was right. The first time I met Diana Hamann she compared our wine to Dolly Parton. She is hysterical, real and a great mom. She is also an incredible expert on wine. After working in for wine.com she ventured out on her own, working as a sommelier and teacher in Chicago. She opened The WIne Goddess in Evanston, IL in late 2012. I was lucky enough to have the opportunity to revamp her logo. I loved the image of Venus as the goddess, but did not love that it begged to always be in the upper left hand corner. Below was my original presentation to Diana. The new round "seal" can be placed anywhere. And the type works well with so many of their materials. We miss seeing the Hamanns, but are so thankful for that fateful introduction. And if you are ever in Chicago, you MUST stop by the store. If you are worried about your kids being bored, there is a train table to keep them occupied while you imbibe. I love doing invitations. It is such an easy way to make an event extra special. Recently I was asked to convert my Astronaut invitation into a Galactic Ball invite for five year old twins. I got fantastic direction from a NYC party planner. I love how they turned out! T loves circular tables. There is something about the equality of it all ... that conversation flows among everyone, not just between those who share sides. In Chicago, we purchased this 3/4 inch piece of circular glass (the diameter is 5'). I wish that I could say it was cheap, but I remember it being around $400. It is burly, though. Many kids have stood on it (without permission, of course). It has scratches of character. And I HAVE to wash the underside ... something I would otherwise ignore! We have had many bases - galvanized sawhorses, painted sawhorses, a twig table. Most recently we made the base out of an old wire spool that I got for free from a local utility company. We painted it grey (Benjamin Moore dark primer, actually). Then added quilting to the top and staple gunned leftover suzani fabric. And I can easily switch it up on a whim! A couple of years ago I went crazy for Minted. I entered every contest and waited with baited breath for the voting results. I won a wedding invite challenge for my Vintage Bird Invitation, which I still absolutely love. But I have many many designs that did not make it. I am spring cleaning my hard drive and have decided to throw my favorite wedding invites and art prints up on my Etsy site. Here are just a few. I customize the invitations for each buyer so they can print at home. The art prints are instant downloads!